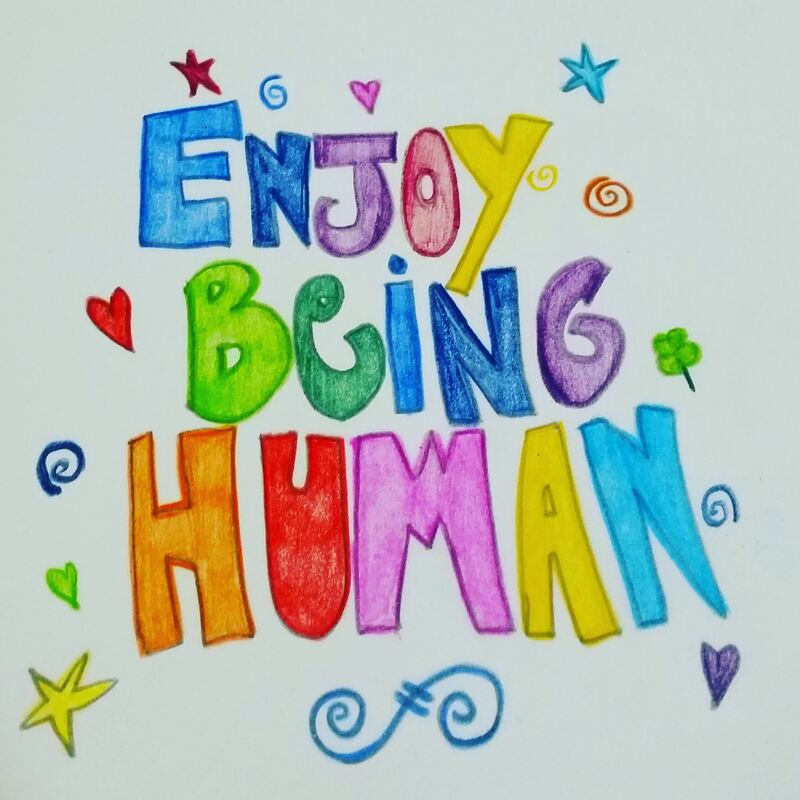 The other day I did some colouring and came up with this prophetic phrase. I hope it inspires you to simply BE with your emotions and mood and embrace whatever is happening in your life, knowing it too will pass. I rarely write about my life when I am back in Perth just meandering around and living from day to day. I like to write a lot and writing about myself and my day to day activities is easy for me. I learnt from someone recently that other people find it really hard to write about themselves. It’s too personal, too revealing, too raw. True, but it’s the truth right? Or perhaps an embellishment of the truth, you decide! So this blog I just wanted to write a little about what I have been doing in a kind of random way. I hope you like it! And it is just fun to write and get some words down, purge my soul with words feels so good. I would love to hear from my readers, please say hello at the end of my post! I have recently been reading a book by Augusten Burroughs. He is a fabulous gay man who writes very personally about his life, antics, experiences and has no qualms in being very explicit. Love that! Not for the faint hearted I guess, but I am very intrigued by the life of others and thoroughly enjoy reading about the nitty gritty dirty secrets of interesting people. Let’s face it, we all have a story. He brags about writing about himself constantly, with confidence. I think this is wonderful, and I hope I can be a successful writer publishing book after book after book. Sounds like a dream life to me! I love to meet new people and try to seek out new people virtually constantly. I like to inspire other people but I also like to be inspired. Other artists and writers and entertainers and progressive people are inspiring for me. Recently I met with a new artist friend. I met her at a workshop I went to for emerging artists and there we exchanged cards and a warm friendly smile. I like to be open minded to the possibilities of new friendships, you never know when a new person will cross your path, offer some advice, guidance and provide a surge of renewed mojo. She did just that. Ginette Hillman is an amazing women. I would like to dedicate a whole post to her to be honest, so will do that soon. She is new and emerging abstract painter, although she has been an artist, performer, creator her whole life. She welcomed me into her beautiful earthy buzzing home, and we talked and talked about life and health and art and all sorts of fabulous things. She showed me her art works and they were amazing. I could literally see spirits emerging from her abstract works, and many of the bright blues really appealed to me. Her work is unusual, unique and calming. It made me want to paint too. I have already thought of something I want to paint, so I will show you that too once I have done it! Overall it was such a lovely afternoon, and I know we will meet again and continue to exchange inspiration and good energy. On my drive home I came across the most magical sunset. I was drawn to the coastline as I drove, feeling the pull of the stormy night, darkened sky and glowing evening sun. Continually changing, capturing the peak of sunset beauty takes quite the luck! I pulled over hastily and managed to snap this. 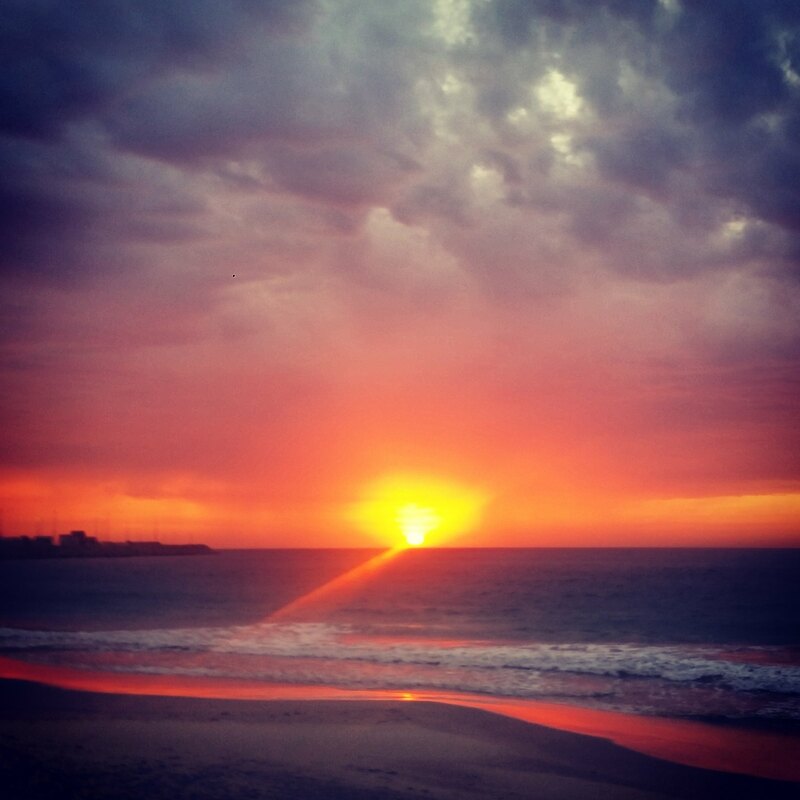 The sun setting at Port beach near Fremantle. A very impressive setting with an impeding storm hitting the coast later that night. Another really cool thing I did recently was attend a dance event at Scarborough beach amphitheatre. This is a weekly outdoor dance event and I had such a good time. It was so refreshing to dance outside in the fresh air, and in flat shoes on the casual sandy floor. It was nice to dance again too, I have missed it! We danced salsa, bachata, and I even had more of a go at zouk and kizomba, more newish styles of dance; more intimate and a little harder to follow, but still very fun. On this night we also had an amazing sunset, I was lucky to capture all these beautiful colours. 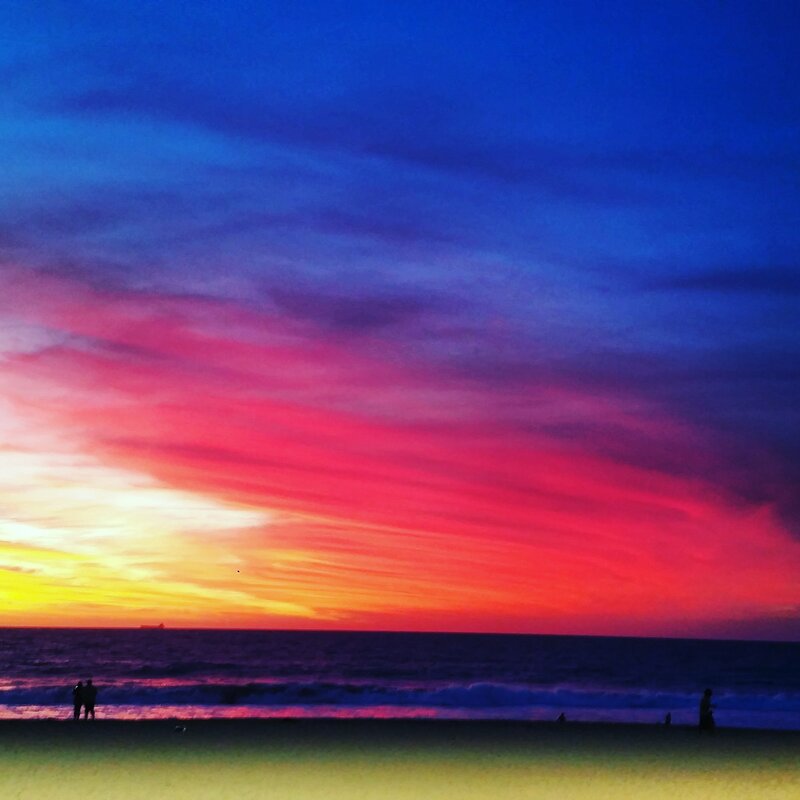 A very colourful sun setting at Scarborough beach amphitheatre, during a night of dancing. So you could say I have been super busy. In between lots of fun activities I have been working a little as a relief Teacher. I love working with teenagers, and when I am working I love the variety of the subjects I teach and the randomness of every day I receive. I used to feel a lot of anxiety and dreaded anticipation for my working week when I was working full time as a teacher; now I don’t feel that. I am restless however, and am looking for other forms of occupation. I am also looking and actively working on expanding myself as a photographic artist and writer. It really is all about believing in yourself, feeling more empowered to make positive step forwards in the right direction towards progress and achievement. I am working on all this as much as I can and aiming to find more exhibition spaces for my work. Just today I scored two new spaces, yay!! More on that in coming blog posts. If you have a space you would like me to exhibit my prints in, I would love to talk to you, please contact me so we can talk and come up with a brilliant plan. I will sign off now. It has been fun and cathartic to write this afternoon, and boom there is 1000 words. I love writing! Stunning photos of your sunset. You pulled over at exactly the right time.